What’s the old saying – everything old is new again? Pretty sure this applies to the PC industry as well. When I started building PCs back in the 1990s, you could have your PC come in any colour, as long as it was boring beige. It wasn’t until the new millennium that Dell started the trend to black, and that’s never gone away. 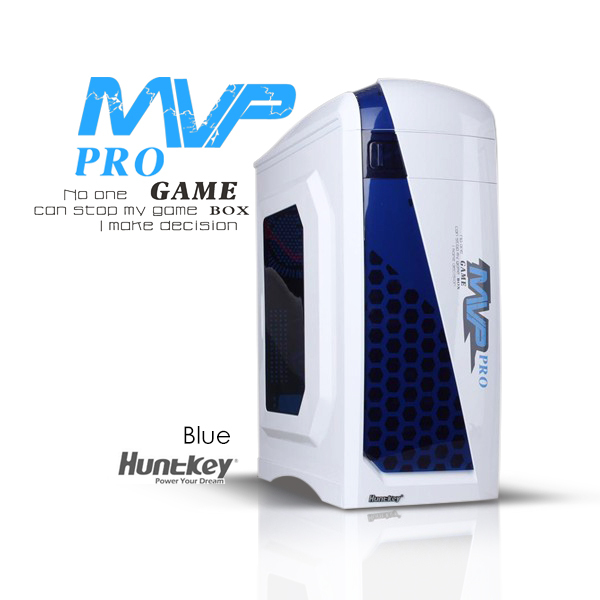 So, in the crowded case marketplace, a few makers have tried to bring back other colours as a way of differentiating themselves, which brings me neatly to today’s subject, the Huntkey MVP Pro gaming case. This little fellow looks interestingly different on the outside – read on to find out if he’s worth $100+ of your hard-earned dough. The outside is fairly rounded, the blue inserts give it a lift. The curvaceous front hides an optical drive bay (just one, unfortunately), with a spring clip to lock it that worked once for me. There’s more 5.25in bays in the standard steel skeleton behind the plastic front, but they are not accessible from outside. 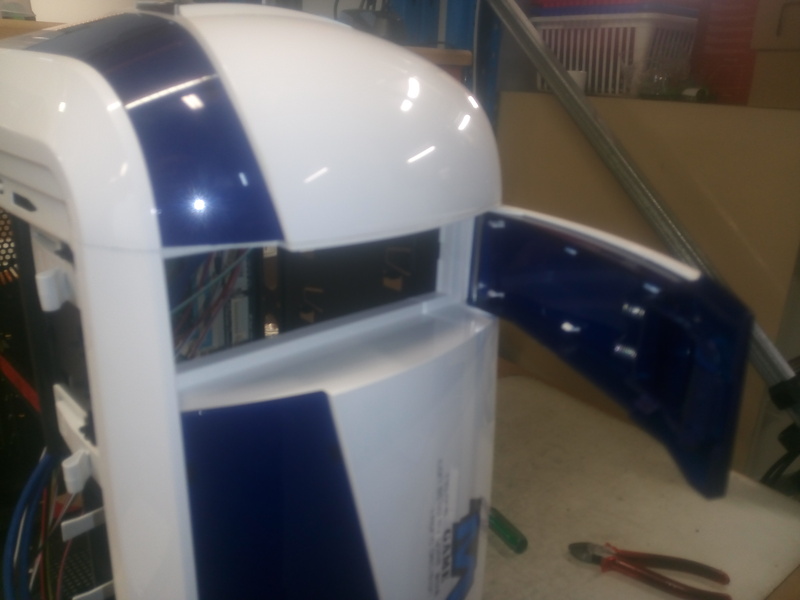 The side panel has a tinted plastic window – you’ll need to provide lighting yourself to illuminate the interior. 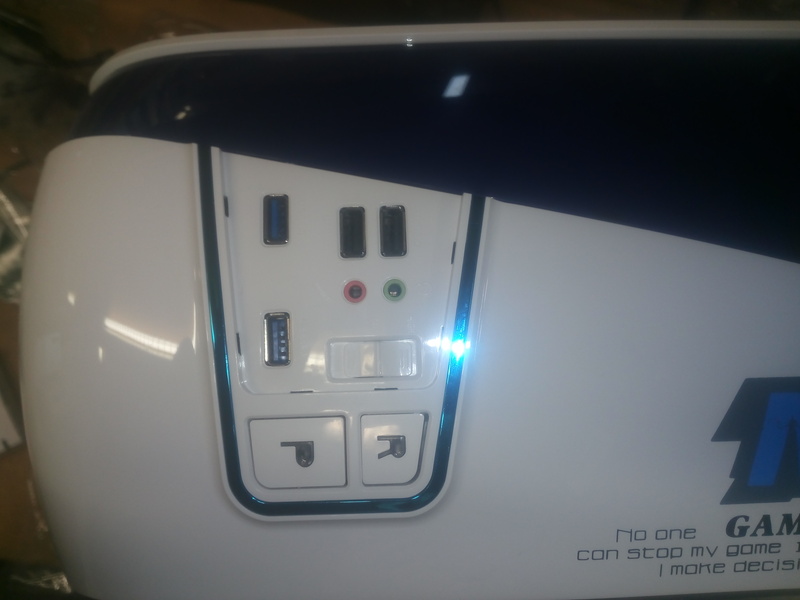 The top has a bunch of USB2.0 and 3.0 ports, audio, power, and reset switches, plus a button to control the lighting. All are hidden under a slide-off blue plastic piece that’s not actually captive to the casing, which opens up the possibility of people losing it, unfortunately. There’s some slightly-Chinglished text on the lid to give it a little character – “no one can stop my game box – I make decision”. Yes, sir! From the back, you can see they provided for external water-cooling with some glanded outlets at the very top, and there’s room for a 12cm exhaust fan or fan-mounted radiator system. 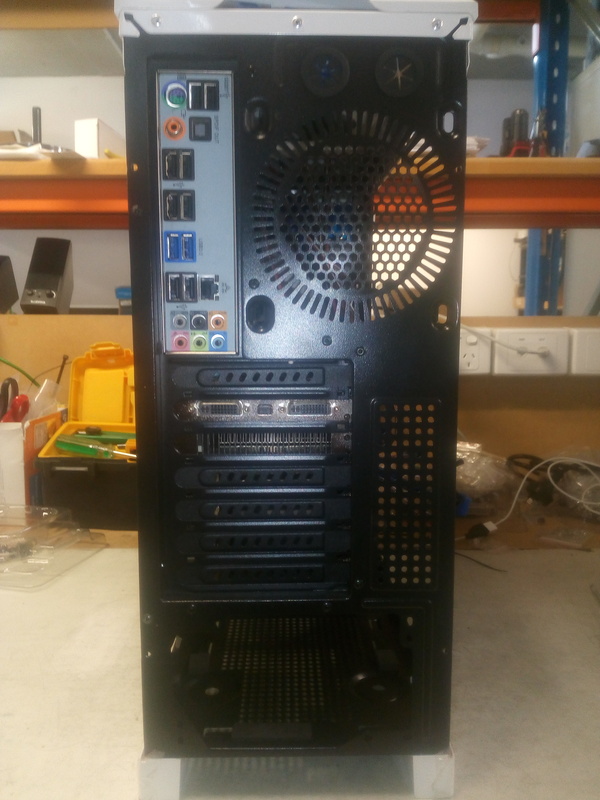 The power-supply hole at the bottom lets you mount the PSU either way up, so you can decide if you want the PSU’s fan to ventilate the case interior or not. Here’s another shot of the power supply mounting area – it’s well ventilated from underneath, and there is a large hole in the skeleton nearby to allow you to send all the power cables behind the motherboard tray for neatness. 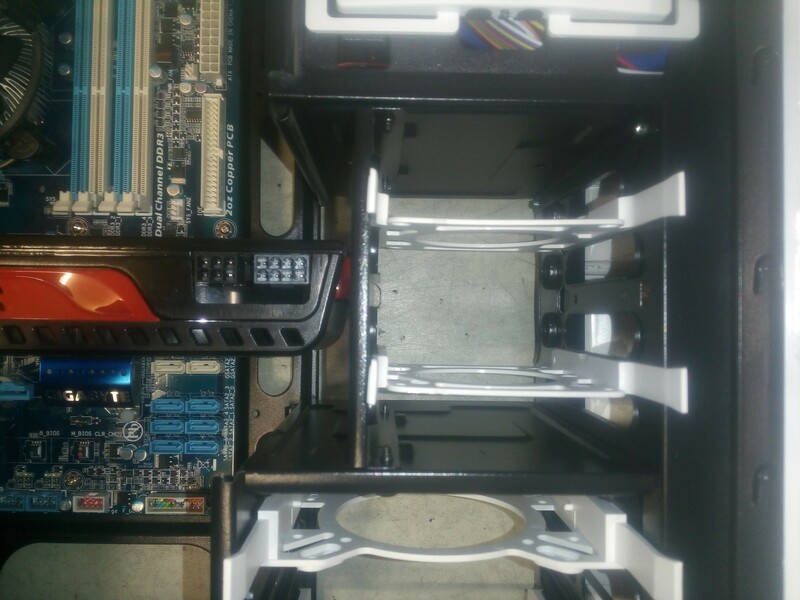 There is what looks like another fan mounting space in the floor in front of the PSU area, but it’s obscured by the bottom legs of the 3.5in HDD bay, and as such you can’t possibly mount a fan inside the case there – it might be possible to mount one outside/underneath the floor there, but in that situation, the fan would be hard up against the ground, and as such would probably get very little intake air, plus I would expect it would quickly get clogged by all the fluff etc that drifted about on the floor, as it’s not behind a grill of any sort. 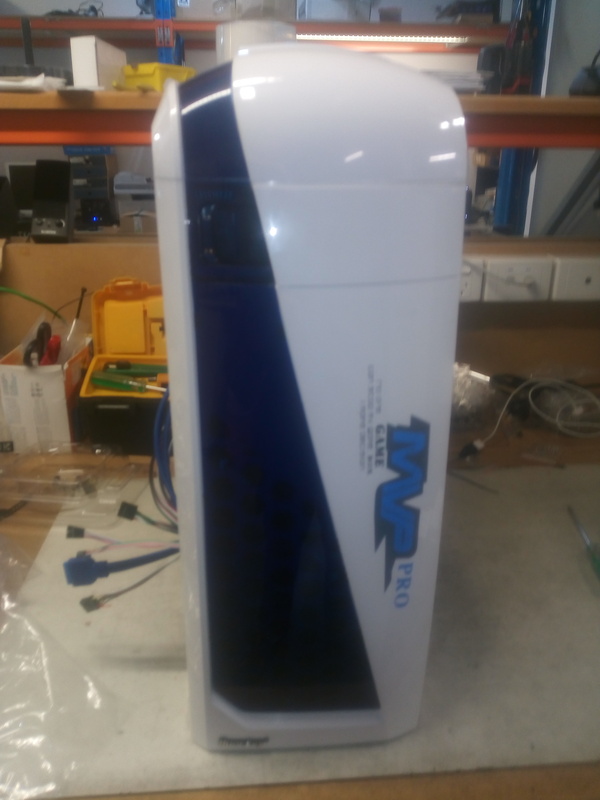 I get the feeling that the floor is from another case design anyway, since there’s holes for mounting traditional rubber feet in it, whereas this case has a white plastic “skirt” to rest on the floor with (you can see the skirt at the top of the pic, and the rubber-foot mounting holes either side of the PSU vent in the floor). 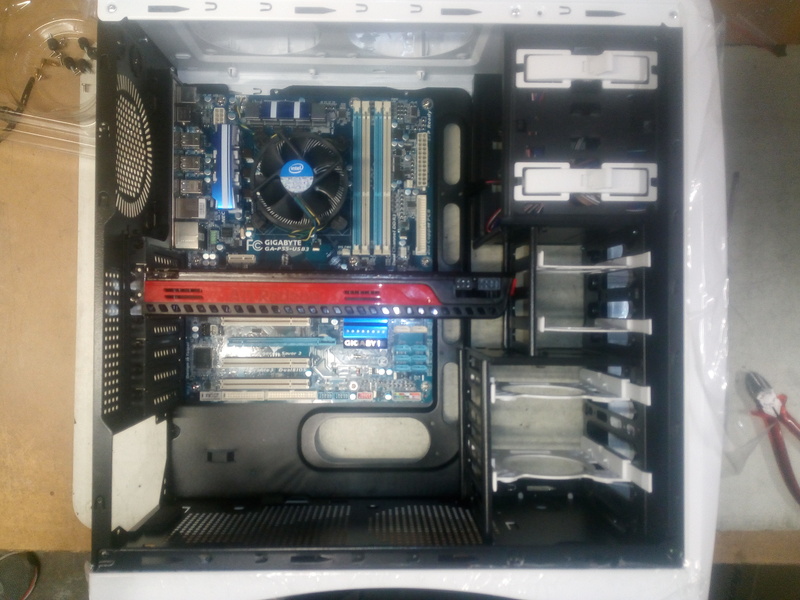 Here’s an overview shot of the interior – I’ve mounted an ATX board and a 32cm-long video card, which are the maximum sizes you could expect to fit into this case – smaller MicroATX boards will also fit. Note the redundant 2nd optical-drive bay clips – it definitely looks like they re-used another chassis as the basis for the MVP Pro. The maker’s blurb says you could mount 2 fans in the front cover ahead of the HDD bays, but doing this would require you to remove the front cover completely. This is a fiddly job, as the cover is clipped-on all the way around, plus you’d have no easy/quick way to get to the fans for when you need to vacuum out the cruft/animal hair from them. It’s only really worthwhile to consider using LED fans here, as they would illuminate the front of the case. 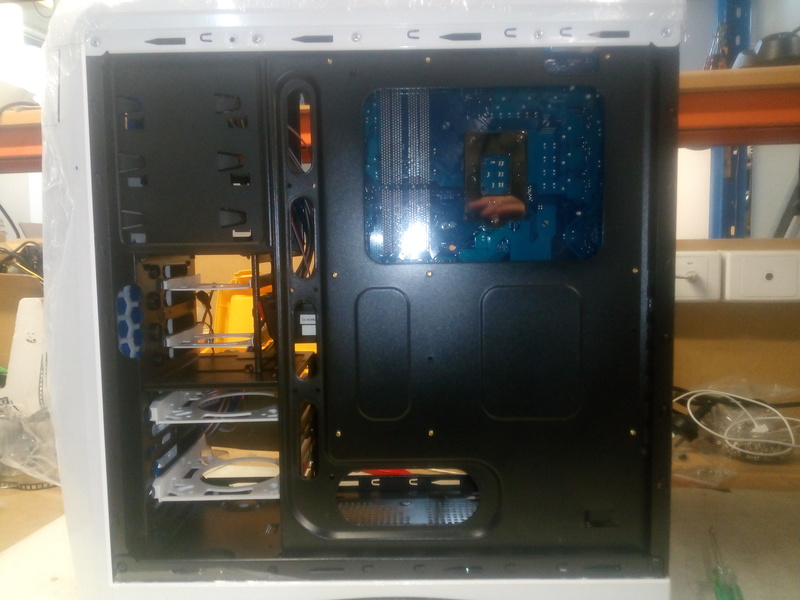 Other fan holes in the top and back of the case are accessible without any dis-assembly, so I’d suggest installing only exhaust fans in the easily-accessible top/rear locations, and relying on their suction to cool the whole system. 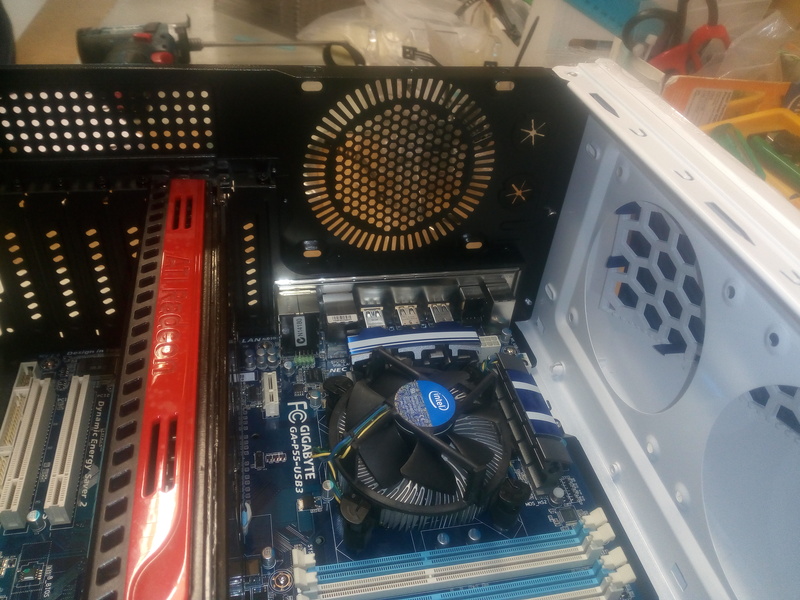 The top area above the CPU has been holed out for two 12cm exhaust fans – you’d probably not be able to install a radiator+fans there though, as the combined thickness would be more than the distance from the fan mount to the motherboard. Note that there’s no adjustment in any of the case’s fan mount screw holes – only 12cm fans will fit in any of these locations, although it would have been fairly easy for Huntkey to make additional screw holes to suit 9cm or 14cm fans as other brands do. Another shot of the top, where you can see the rear 12cm exhaust fan hole and the watercooling pipe glands. 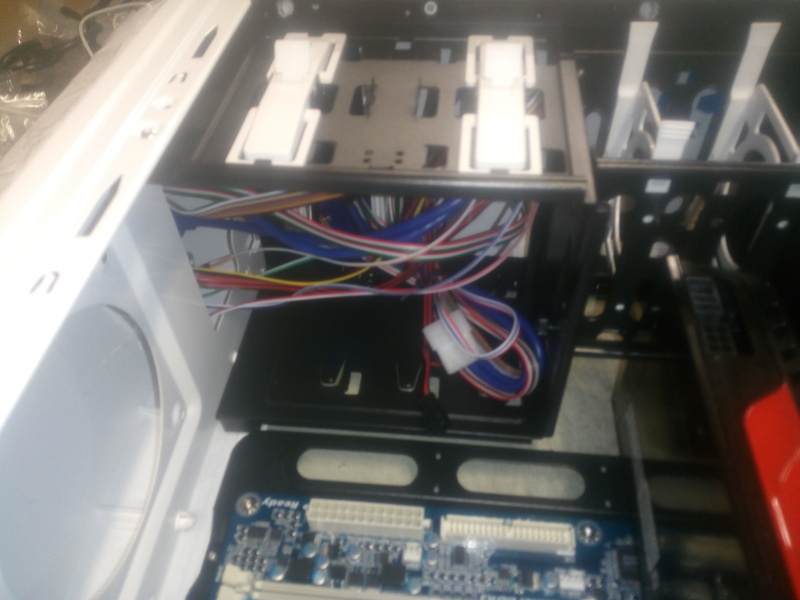 Here’s the interior view of the optical bays – note the holes in front of the motherboard to allow for cable routing. Again, the design shows they re-purposed another case, as there’s 3 bays here, of which only 1 can be used. 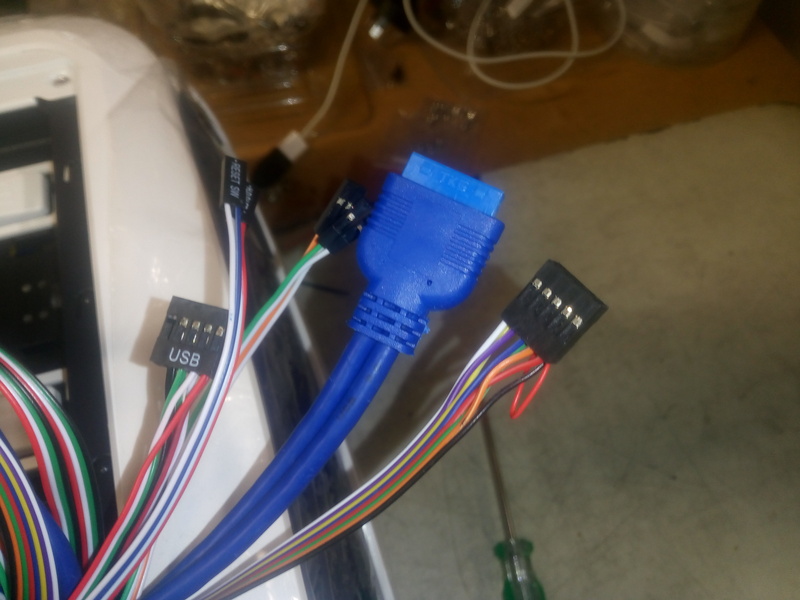 The cabling includes the traditional motherboard header pins, USB2.0, audio, and a more-recent USB3.0 (blue) cable. Here’s hoping that motherboard manufacturers will continue to use the same connector for the just-released USB3.1 10Gbps standard. Eventually, they’ll have to move to USB-C though, and then the case makers will all have to re-tool their moldings to deal with that smaller plug type. 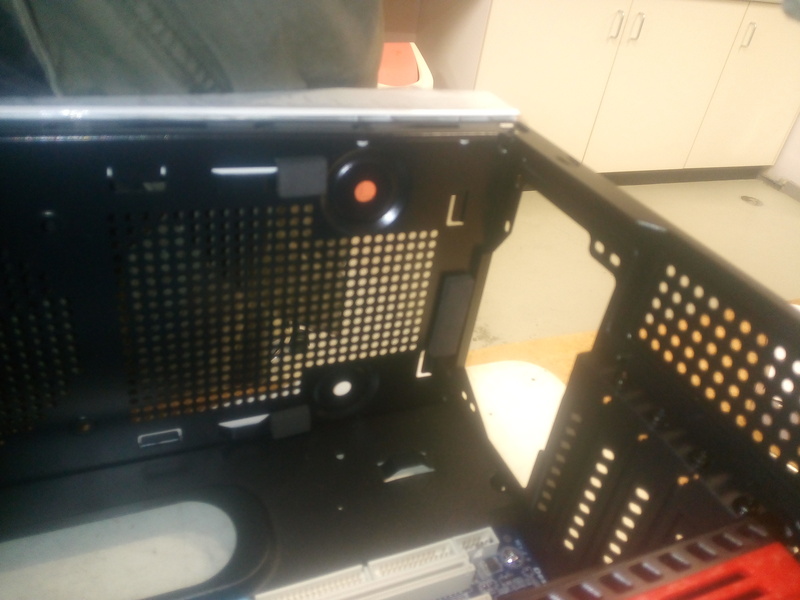 Here’s the rear view of the motherboard tray – plenty of holes to route cables around it’s edge, and whilst it’s not very visible, there is an opening on the top / right edge of the tray, just behind the 8-pin power socket’s location on the motherboard, so you should be able to route even that cable entirely behind the tray. 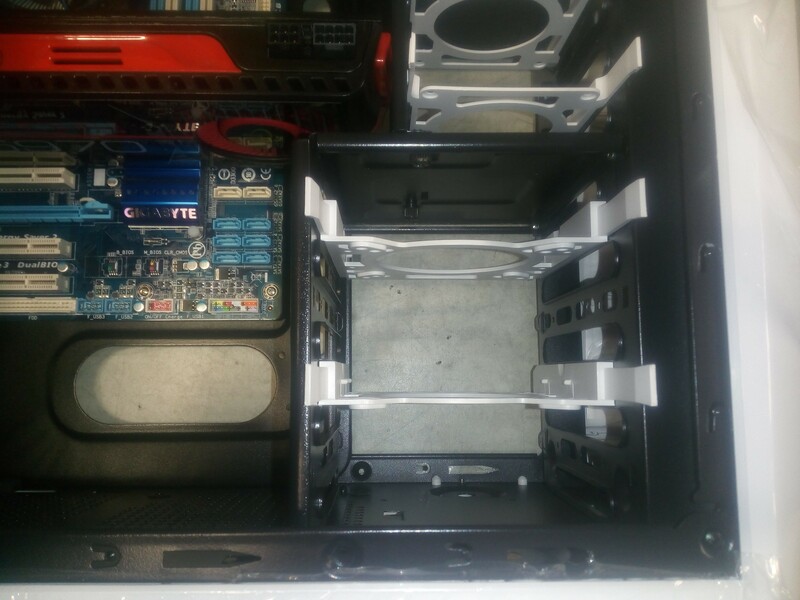 Starting from the top, there’s two removable 2.5inch plastic trays in a bay with room for 3 of them – ideal for SSDs (solid state disks). Kudos to Huntkey for some attempt at style here by making the trays from contrasting white plastic instead of black. You screw the disks to the underside of the plastic trays – they just clip into place in the bay. Note the close clearance of the humongous video card – if you want to do SLI, make sure your chosen cards are both not much longer than your motherboard is wide (approx 27cm). Towards the bottom are two more plastic HDD trays in a bay sized for four 3.5inch disks – again, they just clip in. If I were to send this as a built PC by courier anywhere, I’d remove the 3.5inch drives before shipping, as past experience with clip-only trays is that jolts might shake them loose. The spacing allows you to give the drives maximum air gaps for cooling, but you’ll only ever be able to have a total of 4 disks (4x 2.5, or 2x 2.5, 2x 3.5) in all the drive bays. It wouldn’t have killed them to include a pair of extra trays to let you fully fit-out the bays, but I guess they were under enough price-pressure already for this case design. 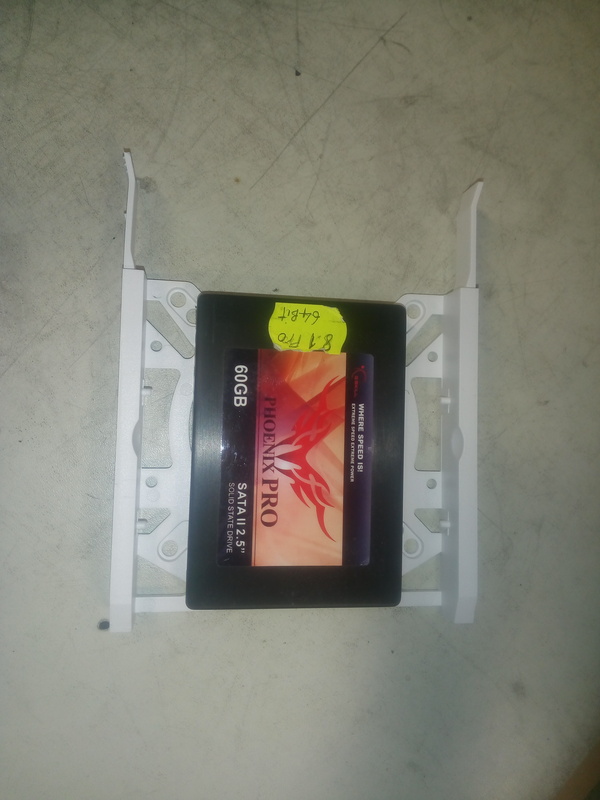 This is one of the 3.5inch trays – Huntkey have thoughtfully molded it with mounting holes for 2.5inch disks as well as 3.5inch, so you could populate this PC with up to 4x SSDs. Given the falling price of flash, analysts suggest SSDs should have price-parity with spinning disks within a year or so anyway. 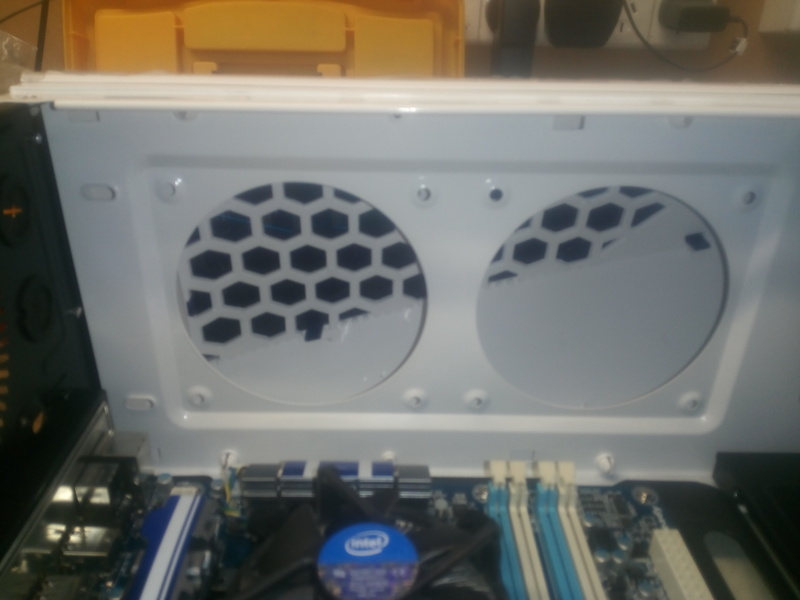 You could even screw a fan to the underside of the tray to cool one disk, although you would have to allow clearance for the fan’s thickness underneath. It’d make better sense to add one fan to the front of the case where it would cool all the drives. This case goes for around $120 delivered without a power supply, which makes it a little more expensive that the generic cheapies, and is verging on brand-name territory. I’d say Huntkey are looking to go a little upmarket so they can steal a little business from the likes of Coolermaster and NZXT – it’s not bad for a first try, but they could have gone a lot further if they really wanted to compete for customers in that area. The case is imported and distributed by PowerhousePC in Silverwater. This entry was posted on August 19, 2015, 2:33 pm and is filed under Cases. You can follow any responses to this entry through RSS 2.0. You can leave a response, or trackback from your own site.